E-cigarettes, also known as e-cigs, vapes, vape pens, and electronic nicotine delivery systems (ENDS), are experiencing rapid growth in popularity, especially among teens and young adults. They come in a variety of forms, sometimes looking like USB flash drives, pens, and other items that make them hard for parents and teachers to spot. JUUL Labs is the manufacturer of a line of e-cigarettes called JUUL. JUUL e-cigarettes are shaped like USB flash drives. These devices create a vapor by heating up cartridges or pods containing oils that come in a variety of flavors such as mint, mango, creme brulee, and more. In addition to flavored oils, each JUUL pod contains as much nicotine as a pack of cigarettes, or the equivalent of 200 cigarette puffs. According to a recent study published in Tobacco Control, teens are 16 times more likely to use JUUL devices than older age groups. The following resources contain more information on JUUL and similar e-cigarettes. Because e-cigarettes are still fairly new, scientists are still learning about the long-term health effects of their use. 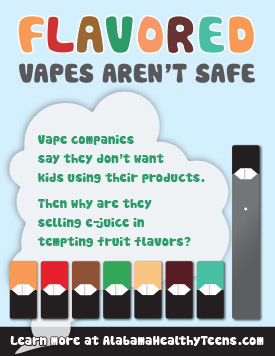 It is known that most e-cigarettes contain nicotine, which is highly addictive, toxic to developing fetuses, and can harm adolescent brain development. Other potential dangers include the ingestion of cancer-causing chemicals and heavy metals such as tin and lead. The Alabama Tobacco Quitline is a free telephone and online coaching service for any Alabamian who is ready to quit tobacco or e-cigarette use. Contact the Quitline for more information.